Tollgene.org is an online repository for microarray, flow cytometry and secreted cytokines data from in vitro stimulated human whole blood. We present an in vitro blood stimulation assay that aims at characterizing inducible immune networks and identifying disruptions in disease. Whole blood is challenged for 6h in vitro with various stimuli, including TLR ligands and cytokines. 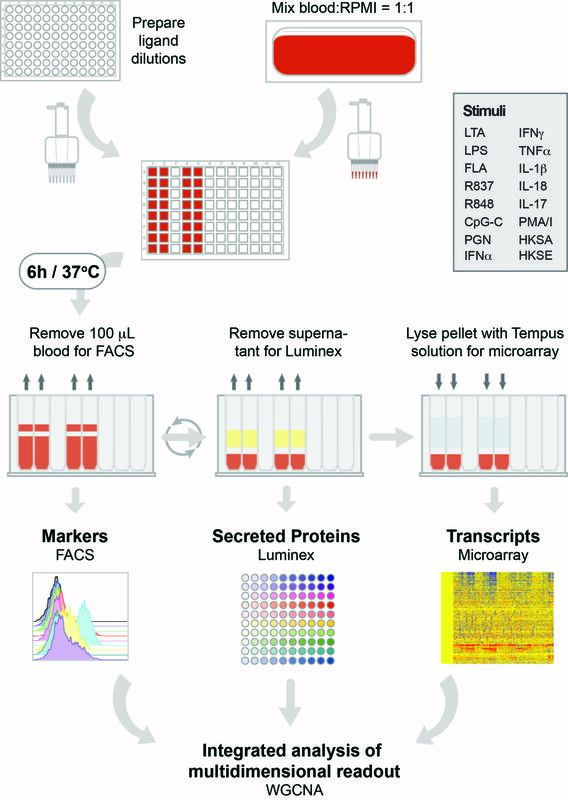 Responses are assessed by simultaneously measuring the transcriptome by microarray, leukocyte surface markers by flow cytometry and protein secretion by Luminex. We developed and annotated a reference set of transcriptional modules based on co-expressed groups of genes across stimuli in healthy adult blood. These modules cover a broad range of inducible immune networks, including the interferon response, NF-kB-driven pro-inflammation, the inflammasome, leukocyte maturation and migration and protein synthesis. Modules can be used to generate stimulus fingerprints or to run gene set enrichment analyses. We applied weighted gene co-expression network analysis (WGCNA) to integrate gene- and protein-level data in both healthy adult and sJIA datasets. 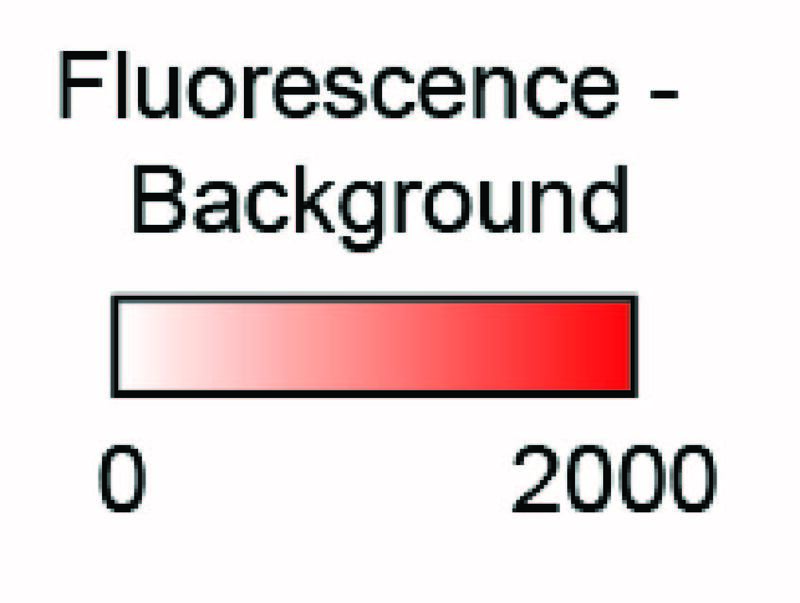 WGCNA generates its own sets of co-expression modules and correlates module eigengene to continuous traits such as flow cytometry geometric mean fluorescence intensity (gMFI) ratios or Luminex measurements. WGCNA also provides gene-level correlations to a specific protein trait. We applied this assay to better understand altered molecular networks that lead to IL-1b dysregulation in systemic onset juvenile idiopathic arthritis (sJIA). Transcriptional and protein responses to several inflammatory stimuli were assessed in inactive untreated patients, inactive patients treated with the IL-1 receptor antagonist Anakinra and active untreated patients separately. We identified exacerbated responses to TLR4 and TLR8 ligands and converse dampened responses to TLR7 in sJIA monocytes. Notes: Human blood can contain infectious agents. Blood needs to be manipulated in a biosafety cabinet, not on the bench, by properly trained personnel. Applying the aseptic technique will minimize the possibility of external contamination of cultures, materials and reagents. The footnote lists the vendors and catalog numbers for the consumables used in the experiments, but does not represent the endorsement of a particular source over other comparable products. Calculate the volume of blood needed for the experiment (0.5mL/well) and number of required ACD Vacutainer tubes. Record transport time (from needle to bench) of ACD tube. In our hands, 0.5 mL of blood yields 1-2 µg of total RNA. The volume of blood/well can be reduced up to 0.2 mL/well. Design plate layout and prepare experiment documentation. Calculate the amount of stimulus to be added per well to obtain the necessary concentration for a total volume of 1 mL (use template table). Dilute each stimulus in total volume of 50 µL of medium per well. Adjust the volumes of diluted stimuli to the number of wells and add 10-15% pipetting overage. Aliquot stimulus-medium mix to the 96-well V-bottom plate which layout that corresponds to the culture plate; the diluted stimuli can be added to the blood with a multi-channel pipette. Cover the plate and keep at +4oC until the stimulation. Note: It is recommended to create an Excel spreadsheet with all the stimuli, their stock concentrations, working concentrations and volumes, so calculations can be easily adjusted depending on the number of samples. Calculate the amount of blood needed for all the wells (0.5 mL/well) and add 10-15% pipetting overage. Transfer the diluted stimuli (50 µL/well) to the culture plate. Transfer the blood to the reagent reservoir and add medium in 1.1 to 1 ratio. Mix gently with the pipette. Avoid splatter. Transfer the blood-medium mix (0.95 mL/well) to the culture plate with a multi-channel pipette. Mix gently with a multichannel pipette. The total volume/well is now 1 mL. Culture the plate for 6h in a 5% CO2 incubator set to 37oC. Note: If the reagents and consumables are not tested for endotoxin, 10 µg/mL of polymyxin B can be added to wells to prevent unintended TLR4 activation with endotoxin (LPS). Remove the plate(s) from the incubator and mix the wells gently with a multi-channel pipette. Remove 100 µL of blood for flow cytometry staining. Centrifuge the plate(s) at 2,000 x g for 15 min at +4oC. Carefully remove 400 µL of the supernatant with a multi-channel pipette and transfer 2 x 200 µL aliquots in 96-well PPN tubes. Plates need to be properly balanced and certified to sustain high g.
Whole blood pellet is liquid and easily disturbed. 200 or 300 µL pipettes are recommended for aliquoting the supernatant. The number and volume of aliquots can be modified according to individual requirements, providing the final well volume is not exceeded once the Tempus solution is added to the blood pellet in a 2:1 ratio. Label PPN racks, store the supernatants at -80oC and update the storage location log. Calculate the necessary volume of Tempus reagent needed for the plate (Tempus to blood pellet ratio = 2:1); add 10% pipetting overage. Pour the Tempus solution into the reagent reservoir of appropriate size. Using a multi-channel pipette, add 1 mL of Tempus reagent per well (that contains 0.5 mL of blood pellet). Mix well by pipetting vigorously but carefully up and down at least 5 times. Avoid foaming. Note: After Tempus reagent is properly mixed in, the color of blood changes from deep red to very dark brown with a reddish hue. Close the plate with the sealable lid; label the plate, update sample log form and store at -20oC until RNA extraction. Note: If the lid does not seal the plate tightly, place the plate in an additional leak-proof biohazard bag or container. The heatmap represents hierarchical clustering of the reference module fingerprints, derived from microarray data of in vitro stimulated healthy adult blood using a method described here http://tinyurl.com/h8uxept. 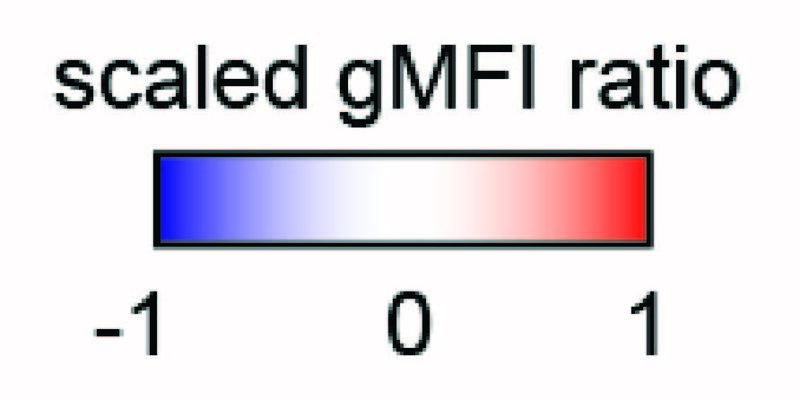 Module score is expressed on a transparency scale as a percentage of represented transcripts that are over- (red) or underexpressed (blue) more than two-fold. Data are normalized to the medium control for each donor. Fingerprints are averaged by stimulus. Median n (donor) per stimulus = 8. *Click on a module to display its annotations and probe content.